When we first got Lola, people were quick to recommend items that would keep her entertained such as a kong. We didn’t really know what a kong was except that everyone we spoke to said we should get one. A kong is a rubber toy that has a hollow middle. It’s quite a heavy toy that when dropped can hurt your toes so watch out if your dog is carrying around a large kong and drops it in front of you expecting to play. Kongs come in different colours and sizes according to your dog’s size which I thought was ingenious. We have the large one for Lola as she is classed as a large dog and it seems to fit her perfectly. When we first got the kong we weren’t sure what we should be putting in it, if anything, however we soon learnt that if we were going out for a little while and she would be in her crate, then the king became a great distraction for her and kept her mind occupied as well as providing some treats whilst we weren’t there. 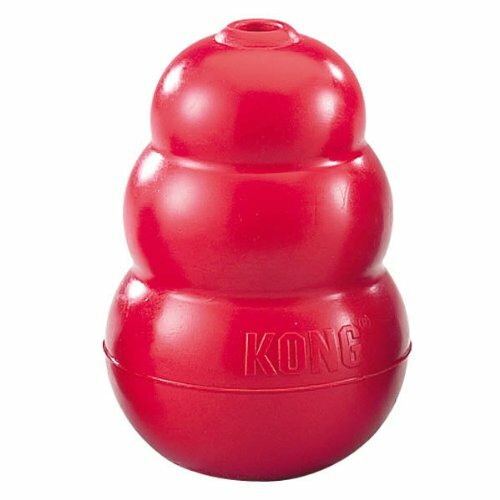 The kong is essentially a puzzle toy that dogs have to work that little bit harder to be able to get the treats that you have hidden inside out again. This keeps their mind active and can prevent boredom which is a god send. Lola’s first treat in her kong was peanut butter as peanut butter is a great source of protein and contains healthy fats though it’s best to get the no added salt or sugar peanut butter. We only need to put a spoonful into the kong and smear it around inside and it keeps Lola busy for ages as she is trying to get every last bit out of all the nooks and crannies inside the kong. Peanut butter is a great treat when we are at home, but if we are going out for a little while and leaving Lola at home then we get prepared and freeze some water inside the kong overnight with some of her kibble. This means she gets a drink when we aren’t there and also she has to work to get the ice to melt. We found that she really liked ice when she was poorly and didn’t want to drink very much a few months ago, so this is a go to recipe for us. As the kong has a large hole at one end and a smaller hole at the other end you have to find something to secure the small end especially if you’re adding water to freeze. I find either peanut butter or a small piece of cheese wedged into this smaller hole works really well. Lola is also a big fan of bananas and she is often seen having her banana treat added to the kong. 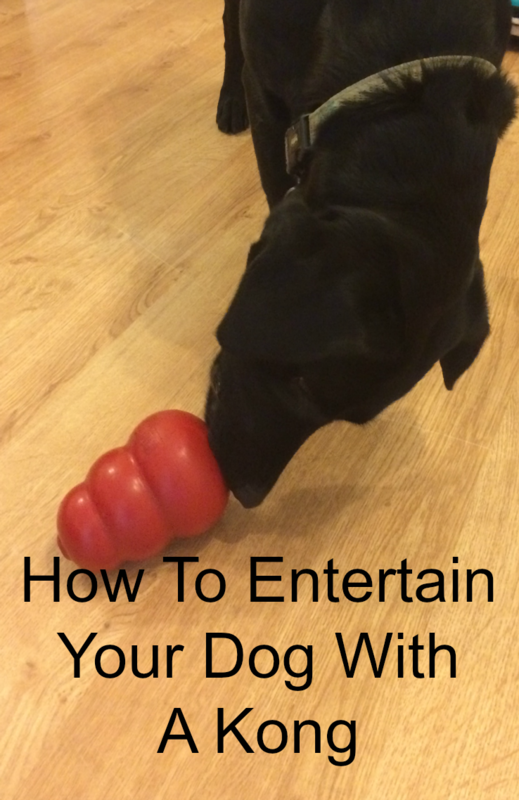 Anything you give to the dog as a treat can be added to the kong to make them work for their treat. There are a huge amount of different recipes and ideas on the internet that you can find to stuff your kong with, many of which we have yet to try but are discovering on a weekly basis. What I really liked about having the kong as a toy was that they really don’t cost very much at all, around £10 for the large ones, but they are almost indestructible which is amazing when you have a puppy. I have spent money on toys that have lasted minutes, but the kong is so strong that it barely has any teeth marks in it after months of daily use. They are such a great item to give to your dog and now I know why people were recommending we got one when we talked about getting a puppy. What do you put in your kong for your dogs?